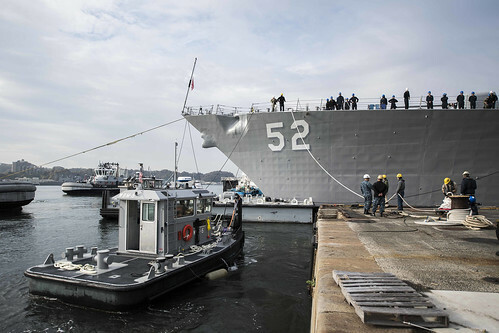 YOKOSUKA, Japan - The guided-missile destroyer USS Barry (DDG 52) left the dry dock at Fleet Activities Yokosuka, Japan, and concluded a routine Docking Selected Restricted Availability (DSRA), Dec. 3. 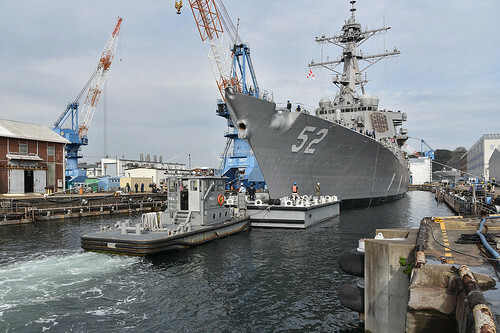 Barry began its DSRA period November 2017 at the Navy's Ship Repair Facility and Japan Regional Maintenance Center (SRF-JRMC) Yokosuka, where a SRF-JRMC team and Barry’s crew worked to repair and modernize the ship. "I am extremely proud of the entire Barry and SRF-JRMC team and the dedication, hard work and perseverance it took to get the ship to this point," said Cmdr. William C. Blodgett, Jr., Barry’s commanding officer. "More than 1.4 million man-hours went into modernizing, upgrading, repairing, and making Barry ready to leave the dry dock." While dry docked the crew and SRF-JRMC performed work on the underwater hull structure, super structure, and propulsion plant systems. The ship also received multiple upgrades to her combat systems and crew berthing spaces. The conclusion of Barry’s dry dock phase marks a large milestone in the ship’s DSRA period. "USS Barry completing this major milestone is significant and brings the ship that much closer to completing the DSRA and becoming operational again,” said Cmdr. Cory Dyer, Commander Task Force 70 Deputy N4 for Maintenance, Material, Logistics and Readiness. “The crew and SRF Yokosuka are striving to accomplish this monumental task." Ships routinely go into DSRA periods to maintain the fleet’s readiness to respond worldwide at a moment’s notice. Barry is forward-deployed to the U.S. 7th Fleet area of operations in support of security and stability in the Indo-Pacific region.